Installment #2 of The Web Comic of the [Arbitrary Time Frame]! PHEW. I think I’m going to call that, TWCot[ATF]! because that’s so much simpler than writing out the entire title! I’ll refer to it as both for a while and slowly ease you guys off until you are all about the acronyms. My family is notorious and nefarious for and with acronyms. My dad has a long list of TLAs (Three Letter Acronyms) with which he annoys people quite frequently. Today I bring you to the wonderful world of XKCD. The site was called this as the author realized that net-real-estate was going fast. All possible combination of 3 letters with a .com, .net, or .org ending had been registered… Knowing this, and not caring what the website was called, XKCDs author wrote a program to come up with possible 4 letter combinations for a domain name, and tried them all out until he found one that is available. XKCD was the first thing to pop up. Already you can see that this author is a huge nerd. Appropriately, the comic is largely geared to nerds such as myself. There are also very cute romance comics and other random strips thrown about. 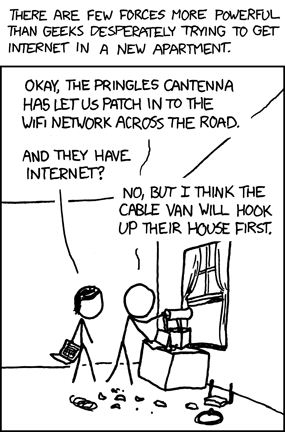 Having just moved into a new and internet free place, I think this more recent strip is highly appropriate. I have been in this position many times, and know multitudes of others who know the feeling. Here’s the strip: Hint: If you go to the website, you can hover your mouse over the image to see funny commentary from the author. For some reason, my copypasta makes the commentary abbreviated and therefore entirely (mostly?) pointless. Topics: Comic of the [ATF], Utterly Random | Comments Off on Installment #2 of The Web Comic of the [Arbitrary Time Frame]!